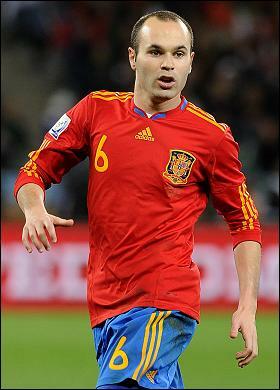 He is the tournament's joint top goalscorer, and at times, he has carried Spain to this final. Under close inspection, it's a mystery to why it has taken this long for the average fan to take notice of Villa's quality. More deadly than Annie Oakley, and with superb mobility - that has allowed him to be effective playing in an old-fashioned inside-left position - bookmakers and Dutch football fans alike will be praying that Villa has an off-day tonight. But don't bet on it. Some have earmarked him as the player of the tournament. While I disagree, the Barcelona man has been masterful at times in South Africa, particuarly in the semi-final against Germany where he ran the show. Sir Alex Ferguson has described defending against Barcelona as akin to being on a carousel that makes you dizzy. Even though you'll have to substitute Barcelona for Spain in this instance, the point still stands. Xavi is the carousel's controller and the one thing you can bank on tonight is this - if the Spanish maestro is allowed to get Spain's fairground ride in motion, they will be world champions. One of my favourite players in the world right now. Iniesta is like football's version of the Greek God Loki, buzzing around with intent and mischief. His sparkling run proved the difference maker in their quarter-final win over Paraguay, and Spain have been a more potent side since he has returned from injury. In Barcelona's Champions League final win in 2009, Iniesta gave one of the greatest displays seen by an attacking midfield player in years, even eliciting applause from Barca's opponents, Manchester United. The impish Catalan is very close to being amongst the game's biggest names and has the sufficient devil to shape tonight's encounter. I expect him to be a major presence in Johannesburg. Level with Villa on five goals in this World Cup, Sneijder is on the verge of one of the most remarkable individual seasons ever seen. Already a Serie A, Coppa Italia and Champions League winner with Inter Milan, the prospect of adding the World Cup and the Golden Boot (and maybe even the Ballon D'or) looms large. While not operating at his best, no player has been in the right place at the right time more than Sneijder has in the past month. I'm sure most of us saw the Nike advert before the tournament that told the world's leading names to "write the future". Sport doesn't function along to a pre-arranged script, but at its best moments it often appears as if it has done. Sneijder is one chapter away from writing himself into football folklore. After suffering an injury on the eve of the competition, Robben's recovery has been remarkable, and he's one of the key names in tonight's contest. He needed just 18 minutes of the last 16 knockout game against Slovakia to show what his country had been missing, scoring one of the goals of the tournament. In the past year he has been the joker in the pack for club and country, and has managed to win many high profile matches on his own. If Spain don't shut him down early, he may just help to confound the form book once again. His clash with Joan Capdevila could be decisive. Yes, Dirk Kuyt. The man who is often mocked by fans in the Premier League. Apart from his own. Liverpool know how important a player Kuyt is. And so do Holland. He'll never dazzle with a piece of skill, he won't be the name on everyone's lips and kids won't want his name on the back of their replica shirts. And that's why Spain cannot afford to ignore him tonight. Since coming to Liverpool, Kuyt has become one of the game's best carthorses. I don't mean this as a criticism. Without his workrate and seflessness, Holland's attacking dangermen would not function cohesiively. Anyone who saw Pau Gasol's performace for the LA Lakers in Game 7 of this year's NBA Finals will know what I'm talking about. His diligence will be crucial in preventing Spain's passing game to flow. If he succeeds, then the safe money has to go on a Netherlands victory.